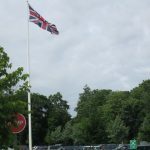 Britain was aflutter with flags celebrating the Queen’s 90th birthday, but at Bletchley Park a few miles north of London, only a single one flew high on a pole. Alone, it was perhaps the most significant Union Jack in the nation. 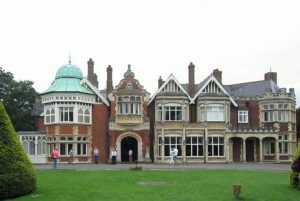 Bletchley Park had played a critical role in WW2 by the breaking of German, Italian and Japanese codes.The code breakers’ expertise is said to have reduced the war by maybe two years and therefore saved many thousands of lives — on all sides. Enigma by Hugo Sebag-Montefiori was in my tower of bedside books when I saw the film The Imagination Game. 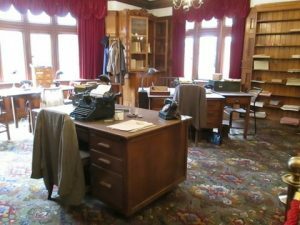 I couldn’t wait to visit Bletchley Park. Although you can take a train to Bletchley Station we drove – and did eventually arrive after negotiating multiple roundabouts and a lack of signage reminiscent of war years. 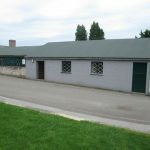 It’s spine-tingling to walk through huts and rooms that have been painstakingly and accurately restored thanks to the input of people who were there during the war. The huts are plain and must have been bleak in winter. 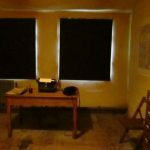 Blackout blinds are drawn as they were when staff increased from hundreds to ten thousand (more women than men) working 24 hours around the clock translating, de-coding or calculating potential solutions. Black Bakelite telephones sit on desks while women’s old-fashioned handbags are slung over the backs of chairs, providing an air of reality. A reconstruction of the Bombe machine used to break the Enigma code is on view in the Victorian mansion where the Commander had his office. 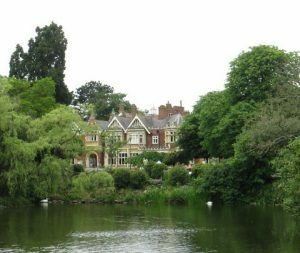 A lake in the grounds of Bletchley Park provided a tranquil place for the men and women working there to meet and socialise — on condition they remained completely silent to each other about what they were doing in their particular hut. Secrecy was paramount until decades after the war. Today you can picnic by the lake. 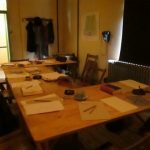 You can also visit the National Museum of Computing, next to Bletchley Park, to see a reconstruction of Colossus — another code-breaking machine that has another historical place in code breaking history. If you haven’t visited Bletchley Park, do go next time you’re in the UK – it’s both sobering and illuminating. I found this particularly interesting Diana, as I did quite a bit of research on Bletchley Park when I was writing and researching My Friend Tertius. Much of what these people did is still under a veil, I’m sure and their lives were influenced by what they saw and experienced at Bletchley. Thank you for another great piece of writing. My Friend Tertius is a great true story that adults as well as children will enjoy, Corinne http://www.corinneking.com – I certainly did.